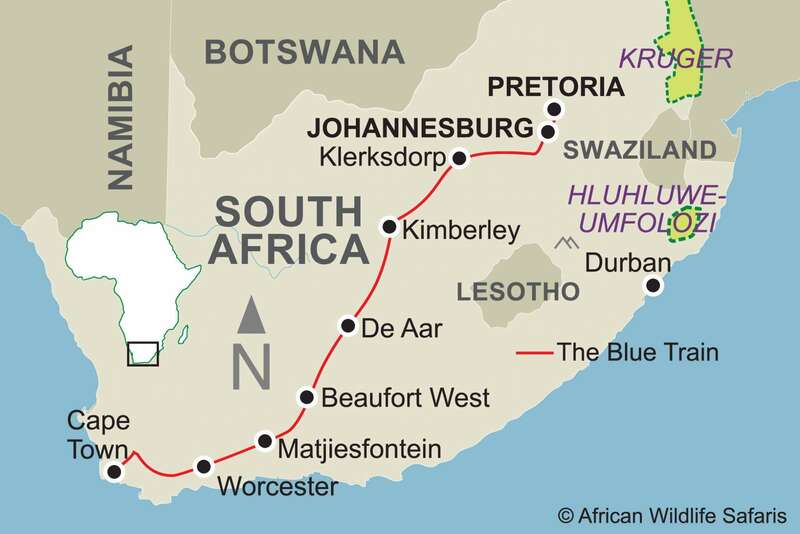 SAVE on South Africa’s luxury Blue Train! Peregrine Travel Centre > SAVE on South Africa’s luxury Blue Train! SAVE 50%* on the second traveller on the iconic Blue Train Journey with African Wildlife Safaris! Want to add a unique experience to your South African adventure? Travel from Pretoria to Cape Town (or reverse) aboard the award-winning Blue Train – an iconic five-star rail journey. This elegant, luxury 1920s themed train is the ultimate way to experience South Africa in style. Accommodating up to 82 guests, each suite includes an enquite, private sitting area and 24 hour butler service. You’ll enjoy the breathtaking views from the large panoramic windows in the grand observation car and indulge in delicious signature South African cuisine! Prices for this luxury 3 day/ 2 night special offer start from $1928* per person twin share ex Pretoria between 02 May and 29 July 2019*.PLUS book by 28 February and save 50% on the second person*!. Contact us via the form below or phone us on 08 8223 5905 to speak to one of the team and find out more about this fantastic offer!